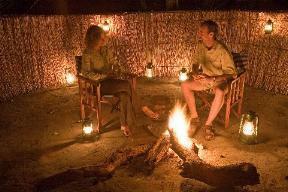 Busanga Bush Camp: The Kafue National Park is 22 500 sq km, one of the largest National Parks in Africa. In the extreme north of the Kafue lie the Busanga Plains - one of Zambia's most significant wetland resources and one of the few areas in the world that remain untouched by development and human activity. The Kafue National Park is 22 500 sq km, one of the largest National Parks in Africa. In the extreme north of the Kafue lie the Busanga Plains - one of Zambia's most significant wetland resources and one of the few areas in the world that remain untouched by development and human activity. The Busanga Plains cover an area of approximately 750 sq km and Busanga Bush Camp is located in the centre of this wildlife paradise. The Plains are home to hundreds of red lechwe, ubiquitous puku, stately roan and the diminutive oribi. Lichtenstein's hartebeest, herds of wildebeest, zebra and buffalo make for a full set of antelope. This wealth of game on the plains is also a big attraction for predators, including wild dog, cheetah and prides of lion. Busanga Bush Camp in the north-western section of the Busanga is about as 'wild' as you can get in today's world: an unfenced mosaic of expansive grassy seasonal floodplains and "dambos" (open grassy areas that sometimes will fill up with rainwater). 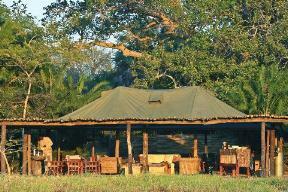 This camp is perfectly situated for some of the best lion viewing in Africa. It caters for 8 guests in 4 well-appointed rooms built of reed and canvas with wall-to-wall views of the spectacular wildlife that frequents the plain in front of the camp. Activities include game drives and night drives, led by qualified guides who are extremely knowledgeable about the area and its wildlife. For those interested in birding, the park boasts 491 species, including endemics such as Chaplin's Barbet.